Don't you love how soothing and calm this color is? 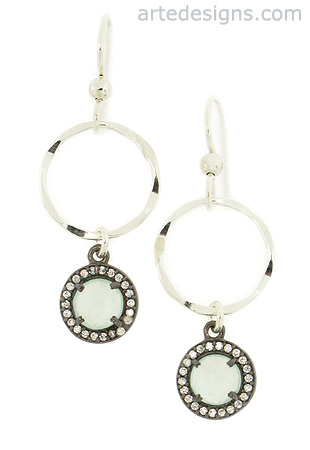 These faceted aqua chalcedony gems are surrounded by scintillating white topaz stones and hang nicely under hammered sterling silver circles. Chalcedony is a type of quartz, so it has similar energies and healing properties of quartz. Chalcedony is believed to help relieve depression and bring emotional strength. Approximately 1 6/8 inches long. Sterling silver wires.